(Bloomberg Businessweek) -- First-class airline service has long been the playground of the fabulously famous and fantastically wealthy, with luxuries ranging from free-flowing Champagne and mountains of caviar in the early years to private cabins with a bed and shower on some carriers today. 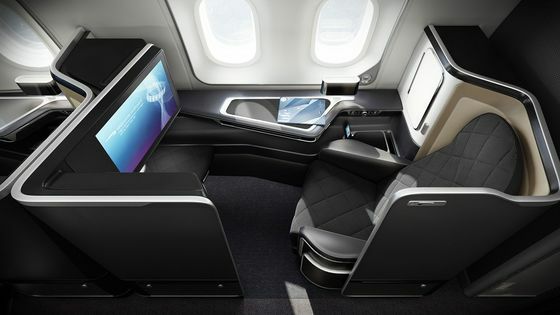 But after British Airways in 2000 introduced lie-flat seats in business class for thousands of dollars less than first—an innovation that quickly spread throughout the industry—it was hard to argue that it’s worth the extra cash for a few more inches of legroom and a better wine list. 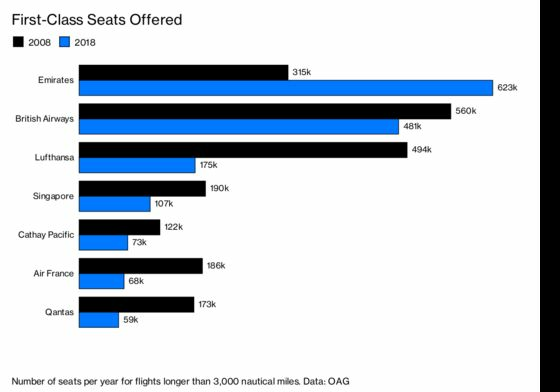 Bookings started to fall sharply as the 2008 financial crisis curbed corporate spending and made public displays of wealth unfashionable, so over the past decade scores of airlines have ripped out some or all of their cushiest and priciest seats. Air France says it’s seeing an increase in demand for what it calls “La Première” for the first time in years, prompting it to reintroduce the option on daily flights from Paris to Mexico City and São Paulo and increase its frequency to San Francisco. British Airways, which in 2016 said it would scrap first class on many routes, plans to revamp the service. The company on Oct. 10 opened a new first-class lounge at New York’s John F. Kennedy International Airport that features private dining booths where travelers can dig into dishes such as lobster bisque with crème fraîche or filet mignon with celery root gratin, each paired with the appropriate chardonnay, pinot noir, or cabernet sauvignon. Emirates Group, which offers 29,000 first-class seats a week across its network, is adding flourishes such as hardwood floors to its service, which had already set the industry standard with private cabins, onboard showers, and safari binoculars for window gazing. Although first class is making inroads again, it will offer fewer seats. Singapore Airlines Ltd. says it’s retooling the first-class cabins on its new Airbus A380 double-decker jets, but it’s going to offer only six suites instead of the 12 that older planes have (though each looks more like a luxury hotel room than an airline seat, with a full-size wardrobe, bed, and leather chair from Italian designer Poltrona Frau). Emirates will cut the number of such berths to 11 from 14 on its A380s, and Lufthansa’s 777 widebodies may get just four first-class seats, down from eight today. The key is getting the balance right, says John Strickland, director of airline advisory firm JLS Consulting in London. 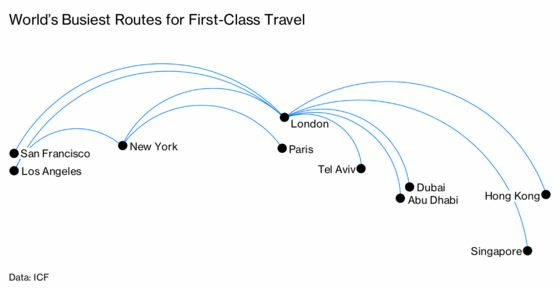 One first-class ticket can generate as much revenue as a dozen in coach or two in business, but the berth occupies only about as much space as five economy seats and one and a half to two business class seats. “First class has a value, provided it’s used judiciously—not sacrificing profitable sales in business class by taking up too much precious floor space,” Strickland says. Even a diminished first class can help airlines buff up their image. Emirates and Etihad Airways sell first-class swag such as toys, vanity kits, and moisturizing pajamas on their websites or during flights. And gauzy promotional photos of chauffeured limousines, opulent lounges, and white-glove service on board can make even passengers crammed into the back of the plane feel as if their airline is offering a standard of luxury beyond what low-cost carriers can manage.